What is the standard format for conducting bhajans? With Ganesha always being first... does it really matter if the Guru bhajan is second... Or can the Mother bhajan be sung second? Should all bhajans be sung on one scale.... Or can the scale be changed with regard to the type of voice of the singer? Which one is more important in keeping the beat? Is it the instrument or the vocalist? We requested some of the senior students and faculty members who conduct bhajans at Prashanthi Nilayam to give us a reply. Here are 15 points given to us by them. 1. Regarding the format: What is more important is that we have bhajans on all Deities. Rama, Krishna, Shiva, Sarvadharma (Allah, Esu, Buddha, Zoroaster, Nanak), Mother, etc. Depending on the place and circumstances we can sing more on some particular name. 2. In Sai Samithis (Centres) they sing bhajans in a particular format. 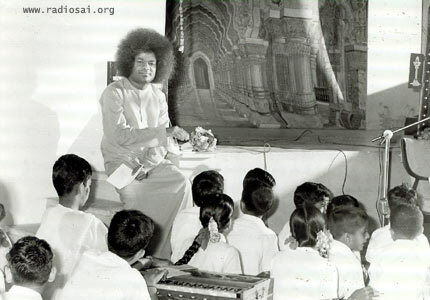 However at Prasanthi Nilayam, we do not have any particular order, except that there should be a mix of all names. Two bhajans on the same deity, i.e. two Krishna bhajans, or two Rama bhajans, or two Shiva bhajans should not occur consecutively. 3. We do have an order in terms of the type of bhajans, i.e. we sing bhajans which have a slow tempo only in the beginning if it is a half an hour or one hour session. 4. We are expected to sing as many Namavalis (bhajans containing only names of Gods) because they are easier to follow and they appeal to all. 5. Only those who have a good voice and are able to sing well should lead the bhajans. This is to ensure that the others will get concentration and divine feelings. 7. There must be considerable difference in the first and the second speed of any bhajan - double the speed if possible. 8. Clapping should be regular and single claps per cycle in the first speed. The second speed clapping could be twice per cycle. 9. Discipline of the singers is very important. They should not look around here and there, or talk during bhajans. Passing of mikes, if any, must be done so as not to disturb the others. 10. Apart from the raga (tune) and tala (beat), the singers must be aware and feel that they are singing only for pleasing GOD (thus sanctifying their own lives) and not for the others gathered there. 11. Singers must do regular practice and voice culture. They must sing only those bhajans with which they are fully confident and which the people around can easily follow. Depending on the following they must select known bhajans. 12. New bhajans must first be sung in smaller gatherings (or taught) so that the followers are familiar. 13. The scale of the bhajans should be chosen in accordance with the singer's voice. Of course one must keep in mind that the followers should be able to follow, too. Usually, all bhajans cannot be sung in the same scale. If instruments are there they help in choosing the right scale, or else the scale has to be related to the previous bhajan suitably. 14. Singers are no doubt very important and if they sing well and with pure feelings it will uplift all others. The instrumentalists must give good support and all in a spirit of dedication to the Lord. 15. There must not be any time delay between ending of a bhajan and the beginning of the next bhajan. If the instrument is giving the lead, it must do it immediately and the singer should start as soon as possible. Please note that this article details the way bhajans are conducted at Prashanthi Nilayam. This is just for the general edification of our readers and in no way meant to force a particular format or a set of rules on anyone. In certain Sai Centres, certain rules and guidelines are laid down by their respective Sai Organizations, which should be followed. The main thing to be kept in mind is the very purpose of singing the bhajans - communion with the Divine.